The 75-year-old music legend is to jet across the pond in May to perform a short run of dates, kicking off at Cardiff's Motorpoint Arena on May 3 and concluding at London's SSE Arena Wembley on May 9. The tour announcement follows the release of his 37th studio LP 'Fallen Angels', being awarded the Nobel Prize in Literature and two Grammy nominations for Best Traditional Pop Vocal Album for his latest record and Best Historical Album, for 'The Cutting Edge 1965-1966: The Bootleg Series, Vol.12'. Meanwhile, the 'Like a Rolling Stone' hitmaker previously confirmed he will not be attending the ceremony in Stockholm, Sweden on Saturday (10.12.16) to collect his accolade. Instead, fellow musician Patti Smith, 69, is to go in his place. 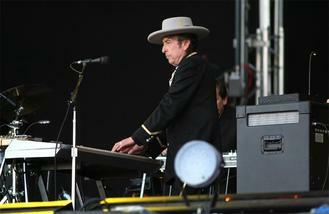 The punk poet will perform Dylan's 1962 hit 'A Hard Rain's A-Gonna Fall'. Dylan will reportedly still be involved by delivering a speech, but not a lecture like previous recipients have given. The 'Blowin' in the Wind' singer took two weeks to accept his nomination for the prize, leading one Academy member to call him "impolite and arrogant" when he failed to return their calls. When the star finally addressed his win, he said: "Absolutely [I will go to the ceremony]. If it's at all possible. "It's hard to believe. [It's] amazing, incredible. Whoever dreams about something like that?"